Lake Wales is managed by Chicago-based GolfVisions, and we found it a well-conditioned, nicely designed layout that clearly had the feel of a Ross course. 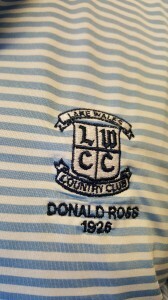 The club proclaims it a Ross design in its website and uses a likeness of the legendary architect in its most recent logo. Ross was involved in the course’s creation for sure, but recent research suggests he wasn’t the only architect and may not have even been the main one. Another almost-as-famous architect, Seth Raynor, was involved as well. A long-time member, Chuck Wolf, played with us on the back nine and alerted us to some revisionist history that was later supported by both staffers at the club, media reports and Internet research. All of it plays out nicely for Lake Wales as well as the Florida Historic Golf Trail. After all, how many courses could justifiably claim both Raynor and Ross as its designer? 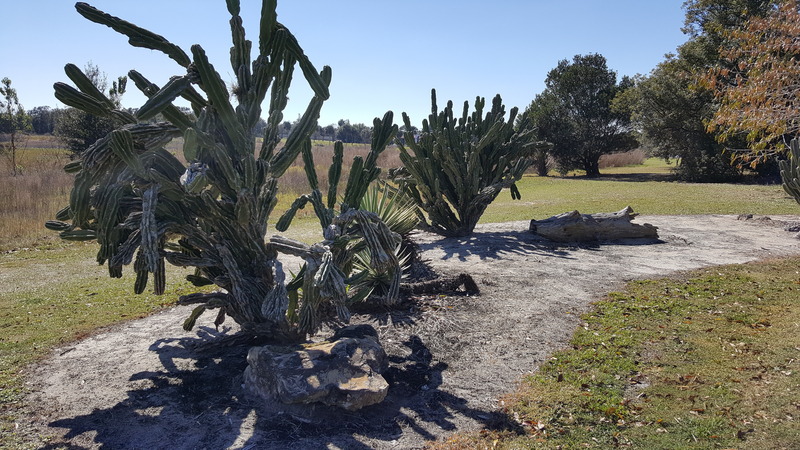 We’ve gotten fascinated in recent years by the Florida Historic Golf Trail, which lists 52 layouts in its celebration of the state’s rich golf heritage. All the courses on it opened between 1897 and 1949 and all were open to the public for at least 50 years. We’ve played eight courses on the Trail and will check out a few more in the next month or two. Some have withstood the tests of time better than others but the last two we’ve visited – El Campeon in Howie-in-the-Hills and Lake Wales – are definitely well preserved. 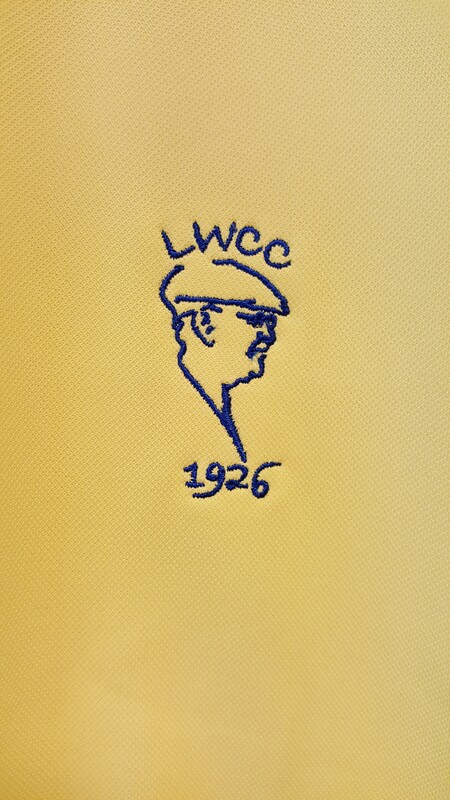 Like many of the courses on the Trail, Lake Wales had a stint as a private club. Circumstances around its opening, though, are where the interesting historical controversy emanates. Lake Wales started as a municipal course that was built for $190,000 and opened in 1925. Latest research suggests that Raynor designed the first nine holes to open. He had designed the nearby Mountain Lake course, which opened in 1918. (Mountain Lake isn’t on the Florida Historic Golf Trail). 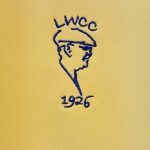 The logo on Lakes Wales’ shirts may require a revision. The Lake Wales mayor declared a holiday on January 27, 1925, for the course’s grand opening and over 1,000 spectators turned out for an exhibition match that pitted two local club professionals – Alic Gerard of Mountain Lake and Jimmy Maiden of Sebring – against two Scottish brothers, Dave and Allan Towns, who had moved to the U.S. Dave was the head professional at Lake Wales. Only nine holes were available for the opening day match, and Raynor died the following January after a bout with pneumonia. He was only 51, and his passing came at a hotel in West Palm Beach where he was staying in anticipation of the opening of one of his other courses. Raynor hasn’t received all the acclaim that he deserves for his architectural work. He started working with Charles Blair Macdonald, who designed Chicago Golf Club – America’s first 18-hole course. Raynor, who was involved in that project, didn’t venture out on his own until about 13 years before the Lake Wales opening. 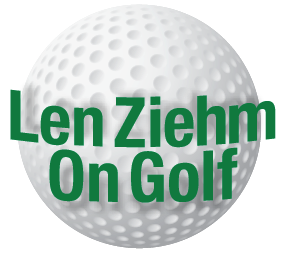 His portfolio, though, includes some outstanding courses – Fox Chapel in Pennsylvania, Shoreacres in Illinois, The Course at Yale in Connecticut and Piping Rock and Fishers Island in New York. 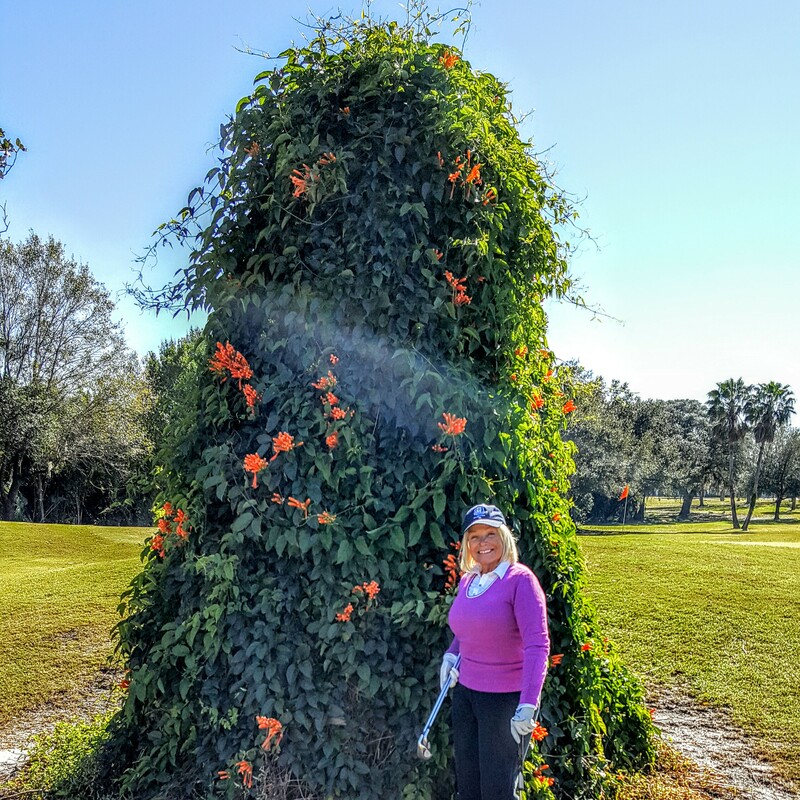 Colorful floral offerings spice up a round at Lake Wales. Apparently Raynor got started on the second nine at Lake Wales but Ross finished it. The second nine opened in 1926. 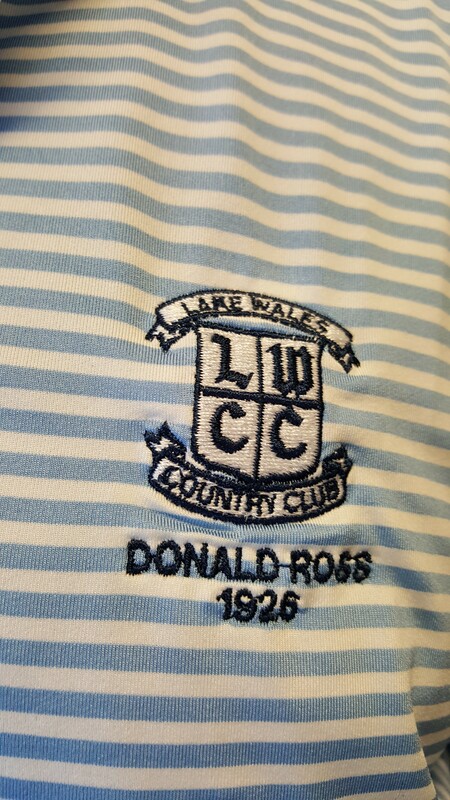 Ross is among the most famous of architects, with Pinehurst No. 2 in North Carolina probably his most noteworthy creation. He was a long-time Pinehurst resident. Lake Wales never achieved Pinehurst status, but the course has hosted many qualifying events for U.S. Golf Assn. 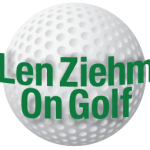 tournaments as well as the Symetra Tour. It operated as a municipal course until a membership group purchased it during World War II. The layout underwent typical updates over the years and the present version measures 7,072 yards from the back tees and 4,263 from the most forward markers. Fairways are generous and the green complexes interesting. Ben Hill Griffin Jr., who had been a caddie at the club during his high school years, took over ownership in 1980 and the present Spanish-style clubhouse was built in 1984 during his ownership period. The University of Florida’s football stadium in Gainesville also bears the Griffin influence, having been named Ben Hill Griffin Stadium in 1989. Private owners purchased Lake Wales in 2013 and it’s become a gated community with a pleasant, well-maintained variety of mediterranean-style homes and condominiums. There’s a wide variety of in the plant look at Lake Wales. This is one of the more unusual.